The following is only informative. It enables the reader to guide its searching. Any information got here should be verified by questioning the concerned producer. Some factories may not exist any more. 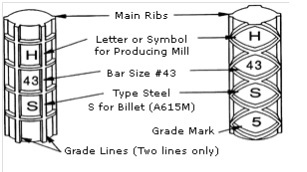 Corresponding rolling marks are kept in the list to facilitate identification of old steels. Two main types of identification procedures exist: European way, which consists in a sequence of numbers and North american. Other identifications also exist but are not driven by a fixed procedure. If you are aware of any other mark, existing of having existed, any other website providing a list including rolling marks please advise us. a number made of one or two figures, to identify the factory. figure rolled onto the steel. For indented steels, the same procedure applies, replacing ribs by protrusions between indentations. See here after an informative list of existing rolling marks (identification of the country is made with the ISO 3166-1 codes).